Stephanie Ellis stands in front of a huge whiteboard covered with notes, phone numbers, and scribbled instructions. She’s in the kitchen at Wild Care, a nonprofit emergency clinic that cares for injured and sick wildlife from around the Cape. “This is our hub,” says Ellis, the executive director. She points to a list of names and phone numbers; they are some of her most dedicated volunteers who agreed to be on call for rescues. She’s not exaggerating. The facility, which is perched on the edge of the Orleans Rotary just over the town line in Eastham, has handled more than 22,000 cases since it was originally founded in Brewster in 1993. The animal hospital treated nearly 1,400 animals across more than 105 species in 2016 alone, and nearly half of those animals were injured by some form of human contact. 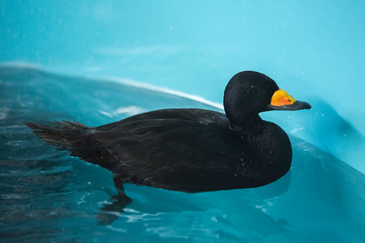 With just one full-time employee at Wild Care – Ellis – the organization’s mission of rehabilitating animals is achieved by more than 150 volunteers and four part-time licensed wildlife rehabilitators. Wild Care is also the only wildlife animal hospital in New England that will send trained volunteers to rescue injured wildlife on a regular basis, Ellis says; other hospitals only take animals brought to the facility by the public. It’s an understatement to say that Ellis and her team are passionate about animal care. Wild Care staff and volunteers handle everything from gulls injured by fishing hooks and turtles hit by cars, to swans poisoned by lead shot and newborn squirrel babies abandoned by their mothers. “Everyone in here requires critical care,” Ellis explains, pointing to rows of animal crates in the clinic, many covered by sheets so the patients can have privacy while they heal. For the volunteers, time donated to Wild Care sometimes means long, often unpredictable hours working with a variety of species with different needs and injuries. “We had 297 baby birds last year,” Ellis says. It also means Ellis and her team sometimes have to get creative working in former farmhouse-turned-animal-hospital, and with a $264,000 budget that is funded mainly by donations, events and grants. Ellis’ tenacity for fundraising and passion for animals has helped as the nonprofit has expanded over the years. 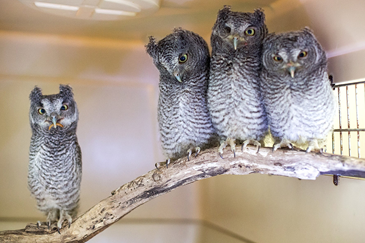 It now includes a raptor aviary (where a Great-horned Owl eyes us suspiciously from the rafters in the two-story space), songbird aviaries, a squirrel shed, and rehab pools in the barn for marine birds. Wild Care has big plans for what the facility could become, too, starting with the barn. Live streaming is important because Wild Care’s mission isn’t just about helping sick and injured animals; it’s also about public education, advocacy, and conservation. Volunteers field calls on an animal hotline 365 days a year. Ellis also brings educational animals around to school and civic groups. It’s hard not to feel her empathy and passion as we watch a volunteer carefully feed a newborn squirrel, so small it can’t even see the world around it yet. Ellis lowers her voice for a moment and holds her head close as the animal grasps a syringe filled with formula and drinks it all up. Visit www.wildcarecapecod.org to make a donation, check out our upcoming events, or learn about volunteer opportunities.